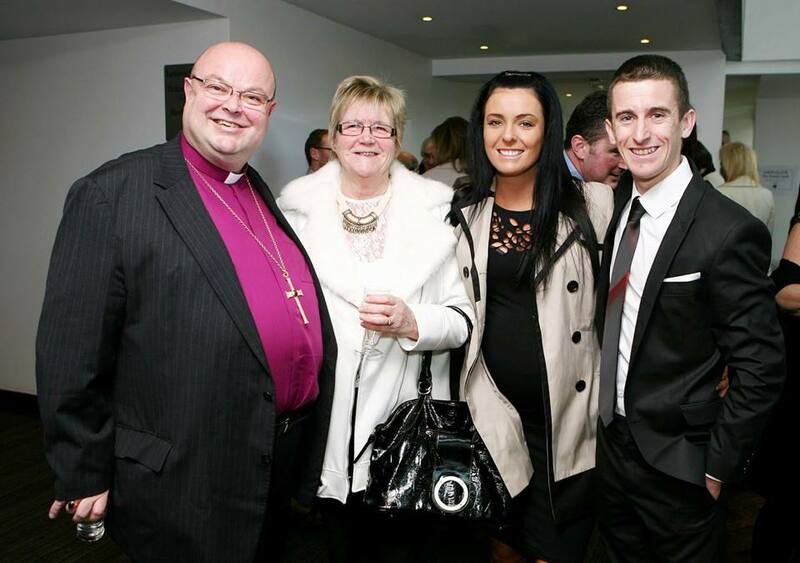 On Friday, 17th January, 2014, Bishop Colton attended the annual lunch and ceremony to announce and celebrate the Cork Person of the Year. This year marked 21 years of the awards. The 2014 winner was World Champion 50 km race walker Rob Heffernan. At the same ceremony County Cork resident Jeremy Irons was made an honorary Corkman with award being presented by David, Lord Puttnam, who became an honorary Corkman in 2013. World Champion, Rob Heffernan (Cork Person of the Year), with his wife Marian, mother-in-law Angela Andrews (a volunteer at St Luke’s Home, Cork), and Bishop Paul Colton before the Cork Person of the Year Award lunch. Pictured at the Cork Person of the Year Awards – front row (l-r), Brian Crowley, M.E.P. ; David, Lord Puttnam; Rob Heffernan (Cork Person of the Year); Jeremy Irons (honorary Corkman); and Sharon Ní Bheoláin (RTE New, Six-One); and back row, (l-r) Manus O’Callaghan (Awards Organiser), Tom Crosbie (Irish Examiner); Willie O’Reilly (Group Commercial Director, RTE); Bishop Paul Colton; Bishop John Buckley; and Tom Murphy (Chief Executive, Irish Examiner). This entry was posted in Bishop, Church in Society, Community Involvement, Diocese. Bookmark the permalink.